UNITED NATIONS, January 30 -- As South Africa's month as Security Council president ends, it had hoped to simultaneously nail down the chair of the African Union. But while Gabon's Jean Ping didn't win a second term, nor did South Africa's Nkosazana Dlamini-Zuma win. Outgoing Council president Baso Sangqu told Inner City Press that after this "no confidence vote," Ping must step down. But will Dlamini-Zuma run again in summer? Sangqu said at day's end that she would be "eligible" to run, not that she would. South Africa's month atop the Council began with the UN in South Sudan failing to get "lethal assets to dissuade" attacks to Pibor, where an untold number of Murle people were killed. But Sudan quickly became overshadowed by Syria, to the extent that by month's end when US Ambassador Susan Rice did a stakeout after the South Sudan meeting, she took questions only on Syria. 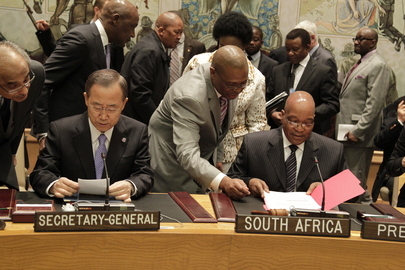 As president of the Council, South Africa had to play an administrative role. So, for example, when the Arab League letter came in asking for a meeting with the Council after the annexes attached to the letter were reviewed, it was Sangqu who asked, where are the annexes? Eventually they came in: click here to view the English translation of the Arab League's monitoring report. By the time Inner City Press obtained this and put it online, the observer mission was pulled out, after Arab League Secretary General Nabil Al Arabi called some -- but reportedly not all -- Arab League ministers. The month went by without any move to a vote on Palestine's application for UN membership; there was, however, a briefing on the humanitarian impacts of Israel's settlements, with rockets from Gaza in the mix as well. There was a day long Middle East public debate, with more Syria than usual. As Syria's Ambassador Bashar Ja'afari spoke about Nelson Mandela, he didn't note that the meeting was chaired by South African Deputy Foreign Minister Ibrahim Ibrahim, who spent time with Mandela in prison on Robben Island -- as Jacob Zuma's cell mate. Another from this group, Nicolas Haysom, was slated for the UN's Afghanistan deputy envoy post, rather than the top spot in Lebanon which went to the Brit Plumley. Just as December witnessed the death of North Korea's Kim Jong Il, January saw Guinea Bissau's head of state pass away in Paris. When Sangqu's Deputy Doctor Mashabane held a stakeout, Inner City Press asked if he'd get a minute of silence, and about the AU through Jean Ping trying to address instability. Mashabane said South Africa would go to Guinea Bissau too; he correctly referred Inner City Press to the GA, where the minute of silence was belatedly held on January 25. South Africa's main thematic debate was, not surprisingly, about the African Union. It started late after some fighting about the speakers' order; President Jacob Zuma came and spoke. Afterward Inner City Press asked Zuma about the fallout from the Council's and NATO's actions in Cote d'Ivoire and Libya. He said the problems are being worked around, just as his foreign minister Maite Nkoana-Mashabane had told Inner City Press the day before. But are they? Watch this site.